No main artist listed on release. Primary catalog number on labels, secondary catalog number retrieved from runouts. By far my favourite release on this label. Many elements, lots of things going on. Never gets old, something for everyone. Big release amidst the UK underground party circuit back in the day. Feef logic is the highlight here. It samples Kano's I'm ready. Used to drop "Feef Logic" in our sets back in the day. Dated sound by today's standards but a pumping piece of techno breaks to say the least. 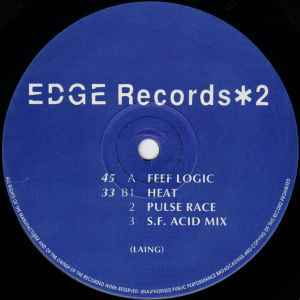 While EDGE #1 is the most well known/played record on this label, EDGE #2 gets my vote for being the best all round EP on this label. S.F. Acid Mix is an awesome reworking of Rabbit City #3, with the samples removed and lots of 303s added, plus some awesome sci-fi chord sequences. Meanwhile, on the flip side we have Feef Logic, with it's crazy set of chanting samples and other vocal snippets. Kicking! !